My Tonto Tour: 14 Days Below the Rim, Part 2. The South Bass trail is named after William Wallace Bass, an entrepreneurial soul, who moved out west for his health in 1883. He prospected and mined in the canyon, and established tourist camps, stage roads and trails on the rim and below. The trail that bears his name connects both rims and is one of the more remote, established/maintained trails within the Park. 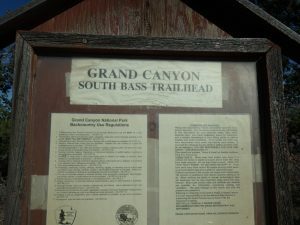 The trail starts out relatively easy, by Grand Canyon standards. 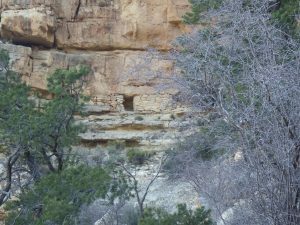 A few switchbacks through the Kaibab Limestone layer and you move down through the Toroweep and Coconino layers via several sets of recently constructed stone steps. At the Coconino, look for remnants of Bass’s wire fence. This area is where you’ll also be able to view prehistoric granaries up, and to the right of the trail. 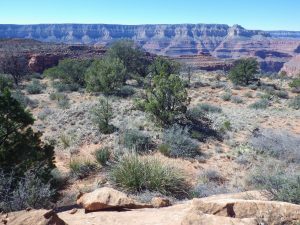 From there, some steep, rocky switchbacks drop you onto the Esplanade – a gently rolling, pinyon/juniper covered plateau atop the Supai formation. This plateau contains numerous agave roasters scattered throughout the area, especially near the outer edges of the platform. After a short hike across the Esplanade, you will arrive at a large cairn, poised above a short ledge. This marks the junction of the S. Bass and Royal Arch trails. If you continue straight, descending to below the ledge, you will clearly see the South Bass continuing on towards the break in the Supai that will take you down to the Red Wall. Heading left, following the smaller cairns, will take you west along the Royal Arch trail. When we arrived at the junction, it was time for a lunch break. By then, the wind had picked up and the temperatures were still quite brisk. With the goal of finding a sunny spot, out of the wind, we did not drop down, below the cairn, instead inadvertently heading left on the Royal Arch trail. My map for this portion of the trip had been cut off when I copied it, and I wasn’t sure where the junction was. The detour was serendipitous. Several very big agave roasters are located along this trail. I’ve documented numerous roasters in the southern Great Basin and Colorado plateau and these were, by far, the largest roasters I’ve ever seen! 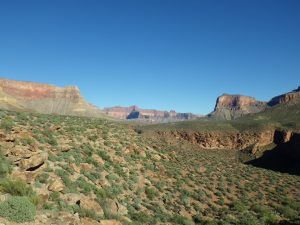 After realizing my mistake, and checking our location with a compass (my friend remembered that she had a small scale, overview map of the trail system) we backtracked to the large cairn, stepped down onto the main trail and hiked the short distance to the edge of the Supai. 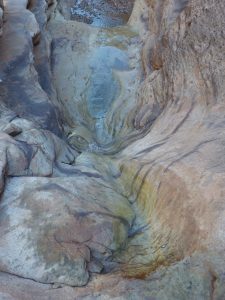 A steep, rocky trail then takes you down to a break in the Red Wall formation, in the bottom of Bass Canyon, down to the Tonto junction. Our little side trip out the Royal Arch trail probably added six miles to our day. Heading down to the Tonto junction my main concern was whether or not we’d have time (daylight) to drop our packs, hike down to the water pools/tanks on the South Bass trail, hike back up to the junction and get to Serpentine before dark. Based on feedback/information I had received on the water quality at Serpentine, I had decided we would tank up at the S. Bass pool before heading on. The water in Serpentine can be highly mineralized, if the flows are low, and can cause cramping/diarrhea. However, a few minutes before arriving at the Tonto junction, we met a group coming out of Serpentine. They informed me that she was running at several gallons per minute, and they had filtered water there the day before with no ill effects. I decided to skip the long process of unpacking, hiking down and filtering. We’d just throw the dice and drink the water at Serpentine. The gamble paid off. We arrived at Serpentine with enough daylight left to find a campsite, get set up and filter water. The creek was flowing beautifully, just like the guy said it was. No ill effects. After a meal of freeze dried beef stew with a packet of Tobasco sauce thrown in for good measure, I crawled into my tent and fell asleep to the song of a peeper, trilling from the edge of the creek. I woke up the next morning with absolutely no screaming. We dropped into Turquoise Canyon around 5 pm. There are a couple of seeping springs above the trail crossing, with a few pools. The water was clear and cold. Dinner was a nice Pasta Bolognese, and some herbed olives washed down with a nice rehydration/electrolyte beverage. In bed by dark (7:00) and a few more peepers. The next morning was clear and calm – perfect conditions for hiking. My Tonto Tour: 14 Days Below the Rim, Part 1. For the better part of three years, I’d been toying around with the idea of a backpacking trip – one that would be my longest, so far, and include the most time I’ve been out solo. From the vantage point, up on the viewing platform of Mary Coulter’s Desert Watchtower, on the south rim of the Grand Canyon, you have a view of the Tanner Trail snaking along below. 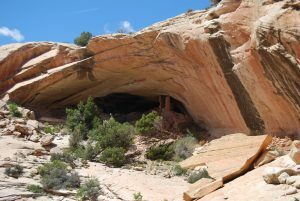 It contours past the head of 75 Mile Creek, passes below Escalante and Cardenas Buttes, then drops, steeply, through a break in the Red Wall formation – a sheer, 500-800 foot thick limestone layer forming one of the major obstacles to anyone trying to walk into or out of the canyon. From there, it winds it’s way for another four miles, or so, to the Colorado River. From the Watchtower, you can see Tanner Beach and the start of the Escalante Route. 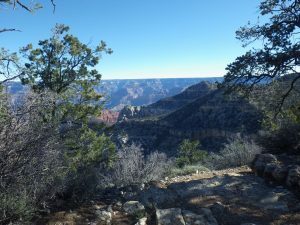 Beginning in 2011, I’d been venturing below The Rim, spending 5 – 7 days each time, exploring different portions of the Canyon: dropping in on the Grandview Trail and heading out the New Hance; Hermit to Indian Garden and out the Bright Angel; S. Kaibab to Grandview, etc.. Each trip spending time with friends, cutting the canyon into 25-30 mile segments, spending some days on the Tonto Platform, occasionally dropping all the way down to The River. 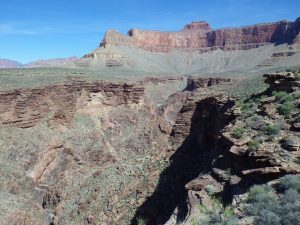 In 2015, after finishing an “easy” trip that took me from the South Kaibab trailhead, down to Bright Angel Campground and Phantom Ranch, then back up the Bright Angel Trail, I was standing on the platform at the Watchtower and it occurred to me: I should do the Tonto, from its junction with the S. Bass trail, in one push, and throw in the Escalante and Tanner trails for good measure. It’s not the PCT, AT or the Hayduke. In fact, by NPS mileages, it’s only 100 miles (various individual hikers state anywhere from 99 miles to 130 miles). I’m splitting the difference and am calling it 115. It’s not a “through-hike.” The entire route, as planned, lies well within the confines of the canyon. There are numerous points where you could exit, relatively easily, if needed. 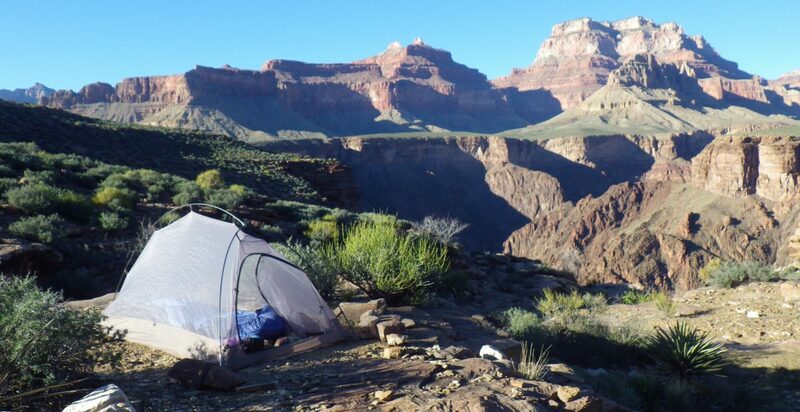 The real trans-canyon thru-hike involves hundreds of miles, mostly trail-less, and has only been completed, in a single push, by a few hearty souls. My intended itinerary would be relatively easy in comparison. The Tonto Trail begins at Garnet Creek or ends there depending on your direction of travel, just west of its junction with the South Bass trail and ends at The River, at Hance Rapid. I chose to go up-river, dropping in on the South Bass trail to hike out the Tanner. Technically, my planned route would not include ALL of the Tonto trail – at the S. Bass/Tonto junction, I chose to head east on the Tonto, without backtracking to the official beginning/end of the Tonto, in Garnet Canyon. It’s an 18 mile out and back, and I didn’t want to insert it into my “loop” hike. I guess I’ll have to go back and explore that section next time. For this particular journey, I would be spending a total of fourteen days below the rim (fewer than 15% of the Park’s visitors go below the rim, less than 1% actually walk all the way to the river). 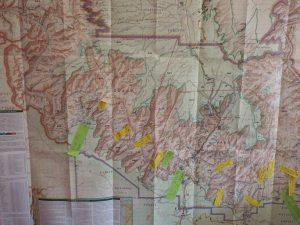 For the first four days of my trip, a friend from Colorado would be joining me for the “Gems” section, then would hike out the Hermit Trail the morning of day five. From that point on, I would be a solo hiker. The start date would be March 6, 2017. Really, it started on November 3, 2016, when I got the email from Ranger Wells telling me I had a permit, reserved in my name, awaiting my confirmation. 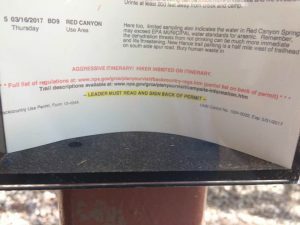 Ranger Wells also informed me that I would need to submit a Hiker Information form – basically, a hiking resume, outlining my canyon backcountry experience. The Park will ask for this if you’ve chosen, by their definition, a particularly “aggressive” or challenging itinerary. That means any solo hiking outside of the corridor trails, or mileages exceeding 10 miles per day. After filling out the appropriate paperwork, I had my permits and the fun started. Planning menus, researching water sources, following weather patterns and laying out and presorting equipment took up a lot of my time. With my layover day at Indian Garden, my mid-point, I’d be looking at 9 mile days, on average. I began preparing. I wanted to pare down as much unnecessary weight as possible – you do carry everything you need to live on, on your back. I bought a luggage scale and weighed everything that was too big for my kitchen scale. I’d already cut the handle off my toothbrush; removed any extra webbing/material from my pack; I bought a Jetboil stove to increase fuel efficiency then swapped out the large lid it came with, for a lighter one, from an old mess kit; I eliminated anything redundant from my gear, paring down my repair kit, first aid kit, and kitchen. I repackaged all of my food, making “dinner balls” with the corners of oven roasting bags, eliminating the bulky, heavier foil pouches that freeze-dried meals come packaged in. 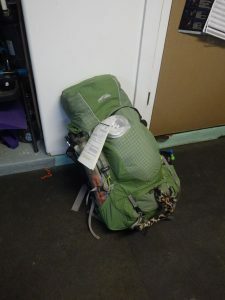 With a re-supply arranged, with friends, at Indian Garden, my pack would weigh around 30 pounds to start out each trip segment. I usually pack just under a pound of food per day, so it does get lighter as you go. I was also able to carry less water each day, as the South Rim had a really good winter. Every side drainage, seep, spring and pothole had water. I was able to get by carrying just a couple liters a day, and filtered out of streams as I hiked. I had also begun preparing myself, physically. After a two week long bout of laryngitis/bronchitis in December, I began “training” for the trip. I put that in quotes because, as experienced canyon hikers like to say, “the only way to train for the Grand Canyon is to hike the Grand Canyon.” Living in Santa Fe, that isn’t really an option for me, so I put together a workout schedule and posted it on the wall, by a countdown calendar, in our home gym: 1 day of arms/shoulders; 1 day of core; 2 days cardio; 2 days leg focused strength training; any local hiking I could get in, weather permitting. Sticking to this routine was not an option, but a requirement. In the past, I’ve hiked down from the Rim to whichever campsite was planned. I’d feel fine, tired but fine. 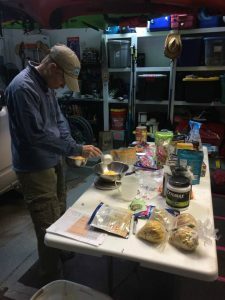 The next morning, however… It’s difficult to describe what 8 – 9 miles of unrelenting, steep, loose, downhill hiking will do to your quad and calf muscles, especially bearing a full, multi-day backpack. I’ve seen the Grand Canyon compared to an “inverted” mountain, and that is not inaccurate. Each step-down, on slabby or loose footing, requires a lot of resistance and control – a fall here could mean a flight out in a helicopter. I call it the “screaming quads.” You wake up, try to stretch your legs in your sleeping bag, and they scream, almost audibly. Hmm, maybe that was me screaming. In all seriousness, it hurts. The lactic acid thing is very real, and it will last for 2-3 days. You try to walk it off, but that just pokes the bear. The first time you try to answer nature’s call is always entertaining. Who knew how difficult squatting could be? So, for this trip, I was not going to succumb to the “screamers.” I bought a weighted training vest for my gym workouts, it was easier to work out in than my loaded backpack. I even wore it walking the dog. I did step-downs, step-ups, elevated lunges, jump-squats, Joel-jumps, burpees (I hate burpees) and too many pushups to count – core fitness helps with actually carrying/supporting the backpack. I guess it all paid off. On day two, after a long hike into Serpentine Canyon the previous day, my legs did not scream, and neither did I. One of the most important steps, for me, was finding someone to run a shuttle out to the South Bass trailhead (bless you, Tim!!). I needed my truck to be waiting for me at Lipan Point, so leaving it out at the S. Bass wouldn’t work. A shuttle was imperative. It takes a couple of hours to drive to the S. Bass from Grand Canyon Village, on unimproved dirt roads. The last few miles, the road is deeply rutted. If it has just rained, or snowed, forget it. It becomes impassible. After passing through a corner of the Havasupai reservation (pay $25 per car, if they have someone there), you pass the Pasture Wash Ranger Cabin, wind through the trees, and arrive at the edge. After unloading the packs, thanking the driver, stretching and snapping a quick photo of the trailhead sign, it began. Any archaeological site needs to be treated with care. They are fragile and irreplaceable. They represent our nation’s past, our heritage. And, for many, are the main reason to travel to the Four Corners region. Many of the sites in the southwest are maintained by the National Park Service (NPS). Others are managed by the Bureau of Land Management (BLM) or US Forest Service. 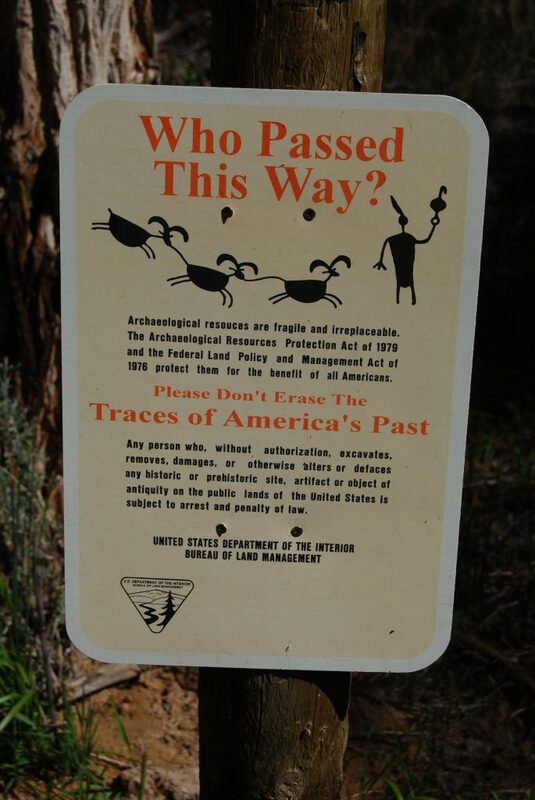 The rules for visiting archaeological sites located on public lands are the same: take as many pictures as you want; do not take any artifacts or relics from public land; do not make rubbings of rock art or make any marks of any kind on a rock art panel; if a site is barricaded, view it from outside the barricade; if there are signs asking you to Keep Out, respect the sign; when visiting habitation sites, do not walk on the midden. Common sense also goes a long way when visiting an archaeological site. If the ledge holding that granary looks like it could come down at any second, it probably will – just stay on the ground and enjoy the view from there. 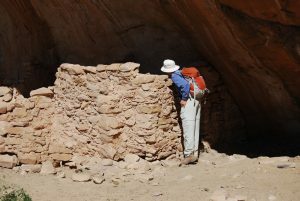 You don’t have to climb/jump down into the kiva to get a feel for it’s history. Do not make little “Museum Rocks” at a site. Piling up the pottery, flakes, corn cobs, etc. doesn’t help anybody. By collecting and piling artifacts, you take materials out of their context, expose them to the elements more than they would be if left where they are and, very likely, you had to trample across the midden to get them in the first place. As you explore a site, the sense of discovery and exploration is going to be much better if you can find the artifacts hidden about on your own, not bunched together on a slab, where they wouldn’t normally be. And, yes, it will matter if you take just one potsherd. If every visitor to a site takes just one potsherd or flake or corn cob, there will be none of those materials left for others to see, or for archaeologists to use in interpreting the site. 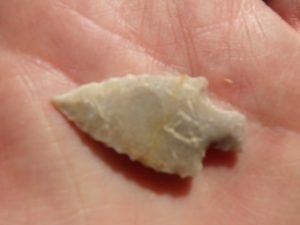 Besides, taking artifacts from public lands – even that “arrowhead” you found on a hike – is violation of Federal Law (Archaeological Resources Protection Act of 1979). Domestic dogs and archaeological sites generally don’t mix. In the heat of the summer, and often just because they can’t help it, dogs will dig down into the soil to make a nice, cool spot to lay down. 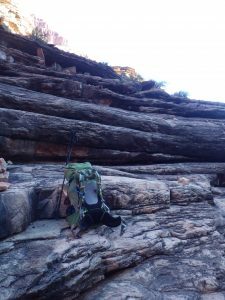 This can be disastrous inside an alcove or rock shelter site, not to mention the impact Fido has when he lifts his leg on a granary wall or room-block corner. I have witnessed both. If you bring your dog, secure him to a tree or rock in a nice shady spot, with a bowl of water, outside of the archaeological site. Any water-source you encounter in the desert is a matter of life or death to the birds and animals living within miles of it. 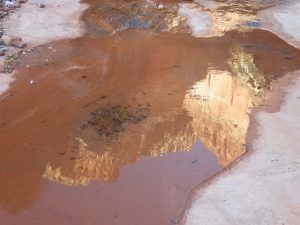 Whether it’s a spring, pothole full of water or running stream, please treat it with care. Don’t bathe in it, wash dishes in it, answer the call of nature, cook or camp within 200 feet of it. And, please, under no circumstances allow your pets or stock animals to walk/play in it. Secure your llama, horse or dog, away from the pool or spring, and bring them a bowl of water. Human and domestic animal waste will ward off wildlife from, what may possibly be, the only water source within miles, as will sun-block, bug repellent, soap or other detergents – even the “bio-degradable” ones. 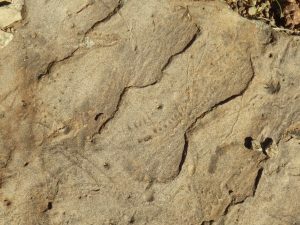 One last note: if you plan to explore archaeological sites in the Four Corners area, observe where you put your feet. Stay on slick rock or established trails. The crusty, black soil you will see there is alive. Composed of living organisms, “cryptobiotic soil” is the thing that keeps this region from blowing/eroding away. It fixes atmospheric nitrogen, helps retain moisture for the plants around it and stabilizes the soil/sand. One crushing boot print or tire track will take years to re-establish. Why so much information regarding what you should not do? Simply put, the desert, and all that live in it, is incredibly fragile. The rules are there to protect it. If a few careless visitors violate the rules, or cause unnecessary damage, stricter guidelines will be made and enforced or, even worse, areas will be closed to access entirely. Take the approach that you are a guest in someone else’s house. You wouldn’t steal, leave a mess or be disrespectful. Look at all that you get to see and do during your visit.